Meet Saint Gervais les Bains - one of the oldest and most famous ski resorts in French Alps. Saint-Gervais is a pretty alpine village, lying on the mountain slopes at an altitude of 850 m above sea level. There are more than 50 trails that are divided into traditional zones: black, green, blue and red, depending on the complexity of the route. In Saint Gervais pride, goodness, calmness and dimensionality are most valued. There is nothing surprising in this - the resort is more than 200 years old, and it is already clearly "aged." For many decades, there has developed its own special culture of rest, which determines the entertainment of local tourists: in the morning skis and walks, at lunch - hiking in boutiques and shops, in the evening - playing bridge, roulette and poker in casinos or balls and official receptions (yes, yes, as in the 19th century!). This is the place where you can feel like a bourgeois in the full sense of the word (by the way, the construction of the resort was once the hand and purse of the famous Rothschilds). Saint Gervais lies in the lower part of the Chamonix valley, above the confluence of the Avr and Bon-Nan rivers. Since ancient times, these lands were famous for their mineral springs and the purest rivers that escape from the Mont Blanc massif. In the 19th century, the sanatorium of Saint-Gervais-les-Bains was built here, which gave rise to a modern resort and the development of the Chamonix Valley as a whole. Now, apart from the balneological complexes themselves, the skiing recreation infrastructure is intensively developing here, the stimulus of which is the picturesque mountain range of Mont Joly (2525 m), combining the skiing areas of Megeve, Saint-Gervais and Saint-Nicolas de Veros, and also providing convenient access to three of the four ski areas of the Evasion Mont-Blanc area and other resorts in the region. Alps2Alps always at your service, welcome! The base price of ski transfer will be as minimal as possible. We never overstate prices for our customers. We always recommend to book the transfer for working day or after the high season. Why? Just because from Monday to Friday Alps2Alps usually makes shares up to 60%. Notice, that the final cost of your transfer will be also dependent on such factors as availability of the vehicle, transfer schedule and other expenses, like toll roads and airport parking charges. If you are going to travel as a part of a larger group and you have some questions to ask, please contact us and we will discuss all details of your future ski trip. In Saint Gervais, the routes are laid very conveniently and allow you to quickly change the level of complexity as the descent process, and simply moving from zone to zone. Going down the western slopes, you can get to the slopes of Megeve, and after slipping along the eastern slopes you can reach the cozy Bon-Nan valley, whose slopes are covered with beautiful coniferous forest. In the upper part, south of the Mont Joly peak, lies a fairly high mountainous area of skiing, which has, oddly enough, "green" level routes from which beginners can observe the beauty of the Mont Blanc massif, and experienced skiers - warm up before the "red" trails of the western slope. As a result, this resort is perfect for a relaxing family vacation, as well as for more advanced skiers. After a busy ski day in Saint-Gervais, you can bath in hot springs or skate on the ice on the ice rink. In addition, there is a modern indoor ice rink, a first-class snow park (the stages of the national snowboard championship are regularly held here), a mogul track, 30 km of plain skiing, many restaurants and bars, a disco, a nightclub, a cinema, a picturesque church (17th century) a stone bridge, a casino, two cinemas and a children's club. For the little skiers, there is also a ski kindergarten «Garderie Le Bettex», a course of training in skiing at a kindergarten, age from 4 years, ski competitions; guest kindergarten «St. Nicolas de Veroce», age from 2 years, a separate ski area. And, of course, a whole range of thermal springs and balneological complexes for all the tourists. With Alps2Alps transfers you can be completely sure of total reliability and the highest quality of all services. We always ready to offer you the most comfortable and safe transfer to Saint Gervais. As you know, on the eve of the season’s start, prices for transfer services to the most popular ski resorts are growing up very quickly. 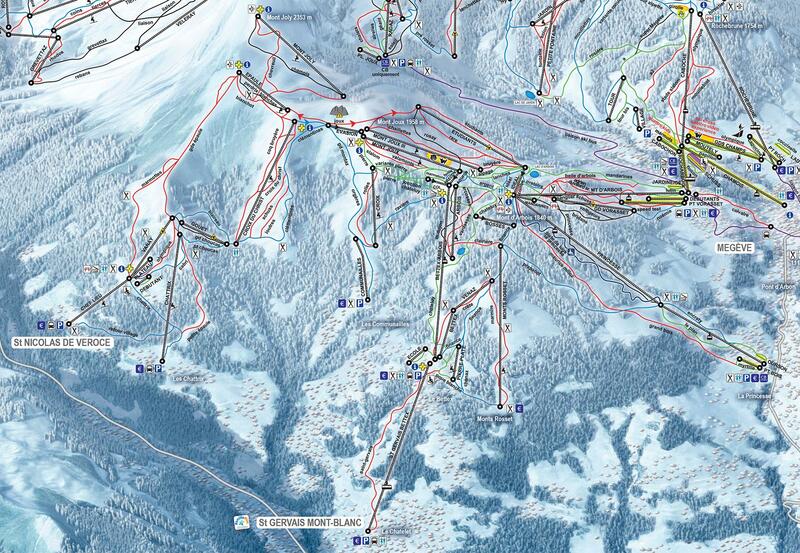 We advise you to book transfer to Saint Gervais in advance to get access to the best deals. Don’t delay it for «afterwards» - book your transfer right now! You want to book the transfer to a chosen ski resort, but you can’t find the information you need on our website? No problem at all! Just give a call to our customer service team and they will give you all missing information. Provide yourself with the amazing start of alpine ski holidays with Alps2Alps!